Everyone has their story… funny thing is, mine started before I was even born. 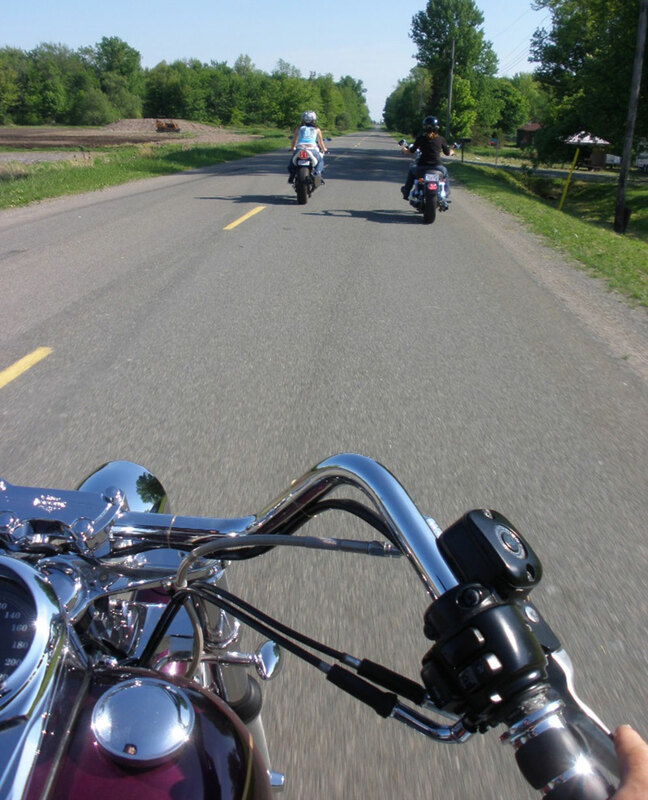 Most people have that specific memory of when they first showed an interest in motorcycles, or when they first felt that adrenaline rush that hooked them for life. For me, I never had that memory, and I wasn’t really sure why. I decided to talk to the people closest to me to figure out where my story started. My mother, an avid motorcyclist herself and owner of a 2011 Harley Davidson Dyna Superglide, made an interesting connection. She said, “I first became interested in motorcycles in the late 60’s, when I saw them riding past my house on their way to Crystal Beach, Ontario.” She said to me, “You never had that memory, because motorcycles were always a part of your life.” She proceeded to share with me that she used to ride her motorcycle during the earlier stages of her pregnancy with me. 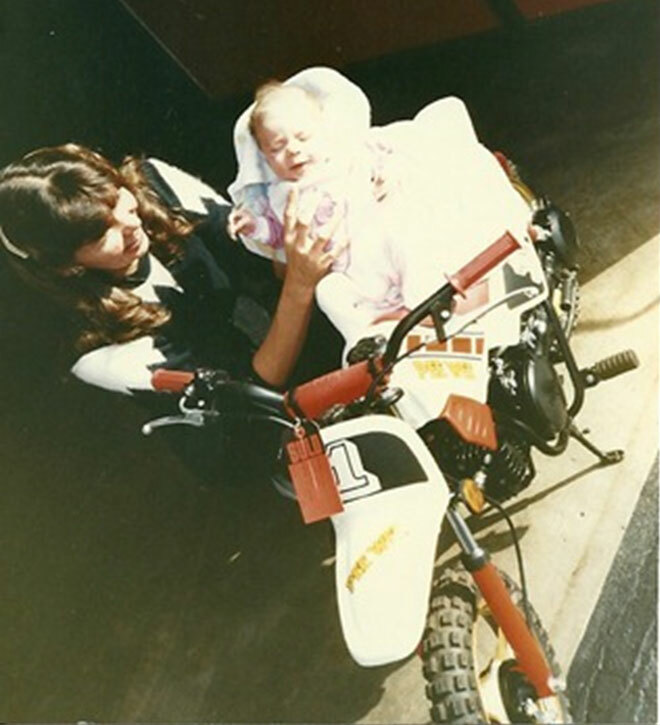 I guess I really was born to ride. The bill of sale for your first motorcycle ever… it’s a prized possession, especially if you’ve been riding for many years. It was something that I didn’t know about until my story started to unfold. During our chat, my mother held up her finger – “wait just a minute.” She ran to her office, shuffled through some drawers and papers, and returned with a yellow piece of paper in her hand. 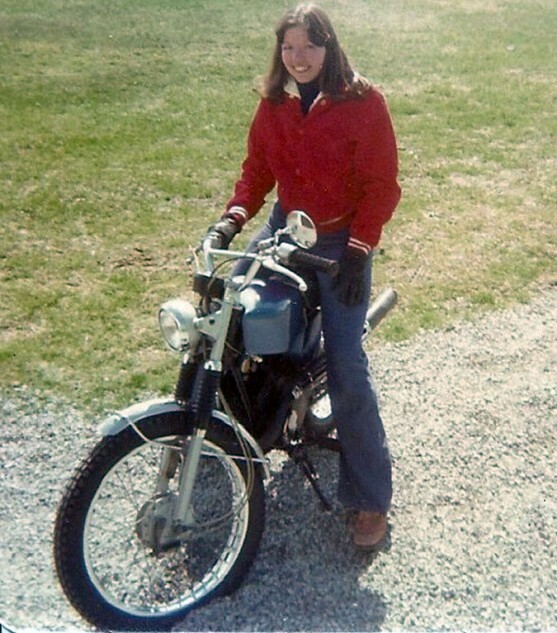 She handed me the bill of sale for my first motorcycle, a 1985 Yamaha PW50, purchased the day after I was born. It even had my name on it. First picture on my new motorcycle! And this is where my story and my adventure as a motorcyclist really starts to evolve. Sometimes you have to look back and wonder if certain things happened in your life for a reason. 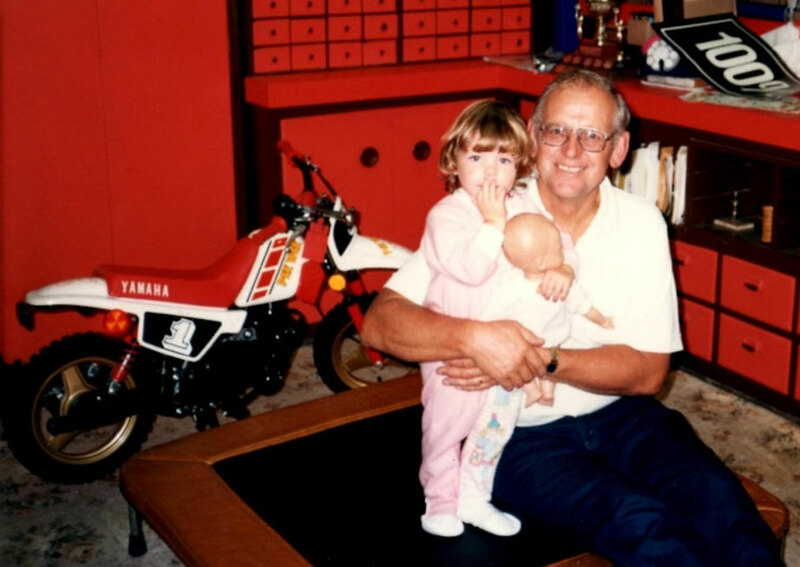 A picture with grandpa & my bike! Little did I know, this was just the beginning. 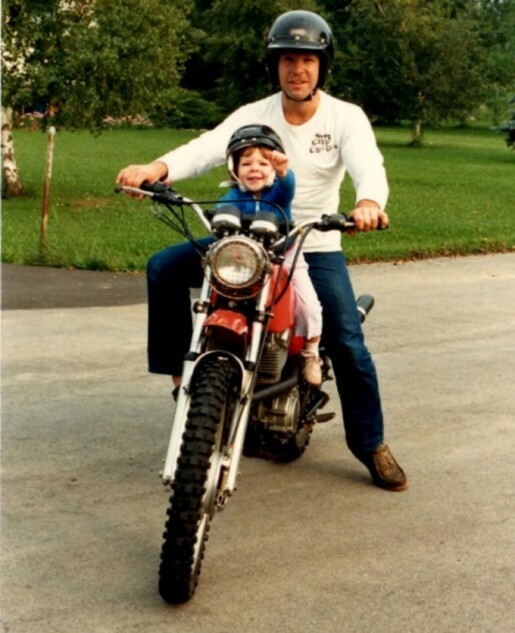 The next years of my life were spent on motorcycles and in the shop with them – my father has always been a motorcycle fanatic, and still enjoys restoring vintage motorcycles. My parents often took my sister and me to the Niagara Parkway for the day to picnic and just relax. And to this day, the Niagara Parkway is one of my favorite places to ride – I love the winding roads along the rushing Niagara River, and the light breeze coming off the trees lined along the parkway. 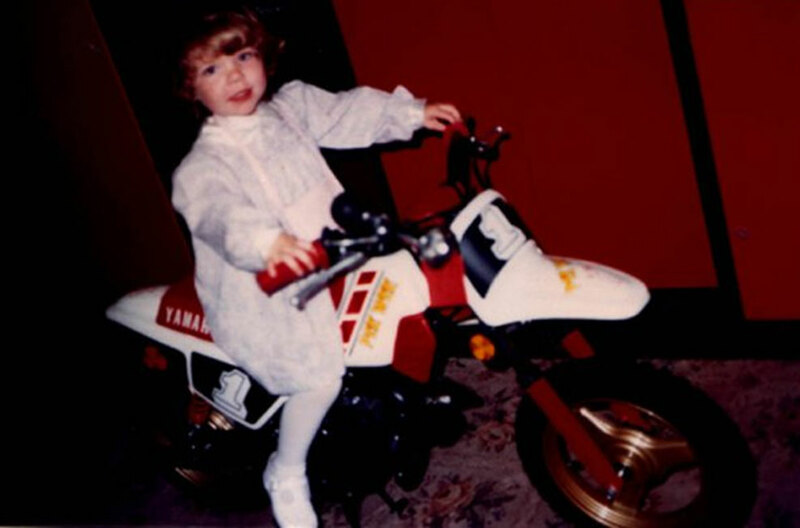 I was five-years old when I took that little Yamaha for its first ride. And there’s video evidence too – something else I found when I started looking into my motorcycle past. I watched my five-year-old self twist the throttle and very shakily ride across the yard away from my parents. I yelled at the TV “give it more gas!” and could only wonder what my parents were thinking at that time. I loved riding that Yamaha, but there came a time where I was just too big to ride it any longer. Ready to ride! Moto girl in the making! The upgrade ended up being a 1974 Yamaha DT175, a classic bike, meticulously restored. It wasn’t a brand new bike but it sure did the trick, especially with a modified exhaust on it! I spent my teen years riding that bike around the “back 40,” as my Dad calls it. Moving away from home was difficult, but it didn’t stop me from going out for a ride with Dad, as a passenger on his 1998 Harley Davidson Dyna Wideglide whenever I came home to visit. It’s great being a passenger sometimes, and I can understand why some people don’t want to trade that in to ride a motorcycle. It’s a completely different experience being a passenger on a motorcycle! 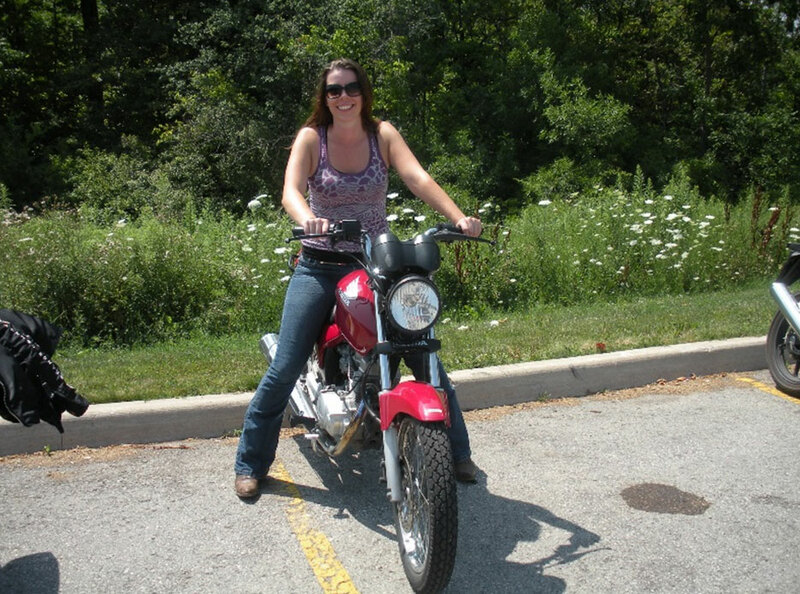 Fast forward a few more years… a group of girls in their 20’s are sitting around chatting and catching up, and one girl says “Hey, we should all get our motorcycle licences!” Now that’s a statement that every parent wants to hear their 24-year-old daughter say! There was no hesitation – how could I have even waited this long?! 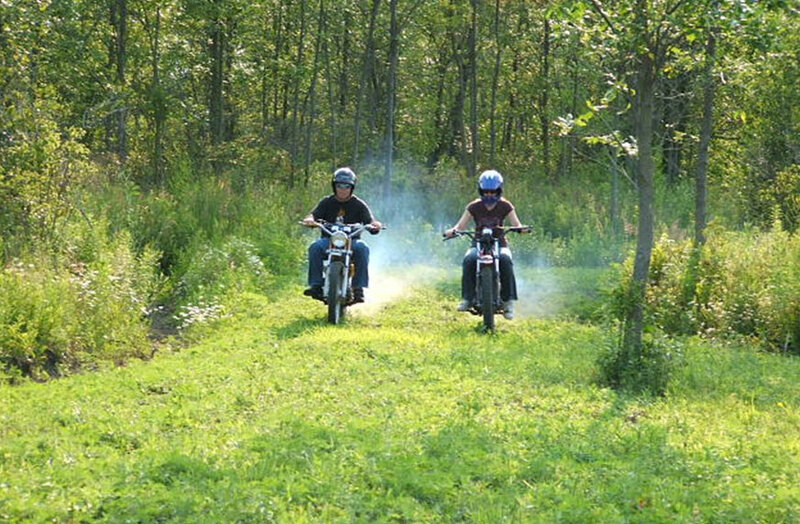 We immediately signed up for the Rider Training Institute course – I passed with flying colors! Within a few months, we had all purchased motorcycles and were happily discovering Ontario’s Motorcycle Roads. Four of my friends bought Kawasaki Ninja 250’s and I decided to buy a 2008 Suzuki SV650. I’m in love with the low rumble of the V-twin engine, the quick steering and of course the power – this bike had my name on it from the beginning! 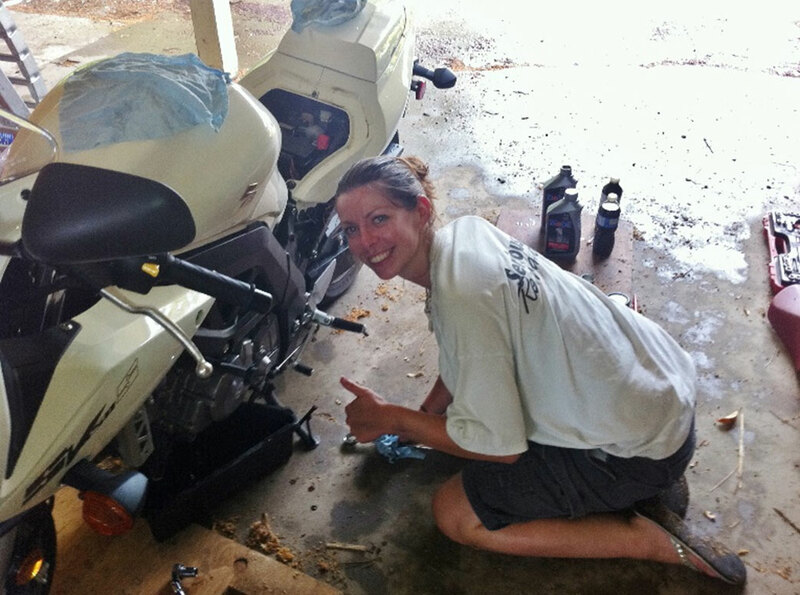 Changing the oil of my new 2008 Suzuki SV650! At first, my parents were hesitant with the idea of me getting a motorcycle, but I said to them, “can you really blame me?” They quickly warmed up to the idea, and we now enjoy many motorcycle trips as a family. 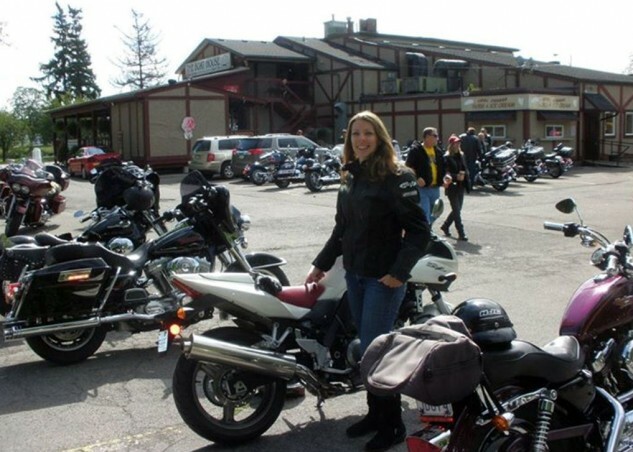 My first time going to Port Dover Friday 13th on my own motorcycle was with my parents. What an amazing experience! I remember riding down highway 6 in Port Dover, into a town gridlocked with motorcycles. It was unbelievable; all I could hear was the rumble of bikes around me, slowly rolling into town for the biggest motorcycle rally I have ever seen. Motorcycles have brought us closer together as a family, and it’s something I plan to continue with my own family one day. And as I sat in my parents’ living room the other day, looking through boxes of old photographs, my Dad stopped to look at the pictures I had picked out. 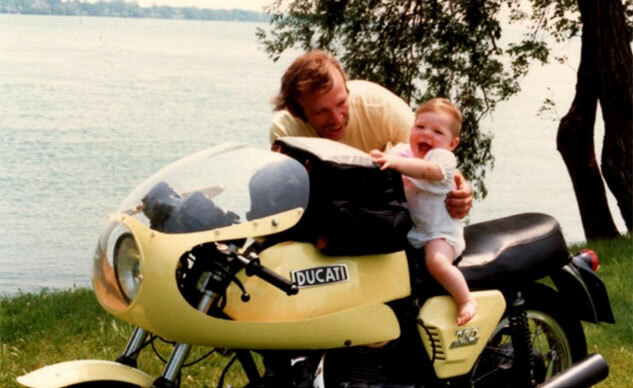 He chuckled, looking at all the pictures I had found of me on motorcycles over the years, and he said “Looks like the nut doesn’t fall far from the tree!” We both laughed, and there was a moment of appreciation for the impact that this lifestyle has brought to our family. I’ve ridden all over the Niagara Region and beyond – enjoying the beautiful escarpment, winding country roads, and amazing scenery. Every sense I have is heightened when I’m on a motorcycle – it’s the biggest thrill I’ve ever experienced! So now it’s March, and I’m just itching to get out on my bike again. My poor bike is all covered up, like its hibernating for the winter. I start it up every now and then; the throaty sound is music to my ears. This summer, I can’t wait to continue exploring Ontario’s Motorcycle Roads, especially in Northeastern Ontario, and by the end of the season, I am determined plan a trip to ride Lake Superior. My story has evolved so much, but part of me feels like it’s still just the beginning. I have so many places I want to go and so many things I want to see. I now see that I was born to ride, and that’s exactly what I’m going to do. 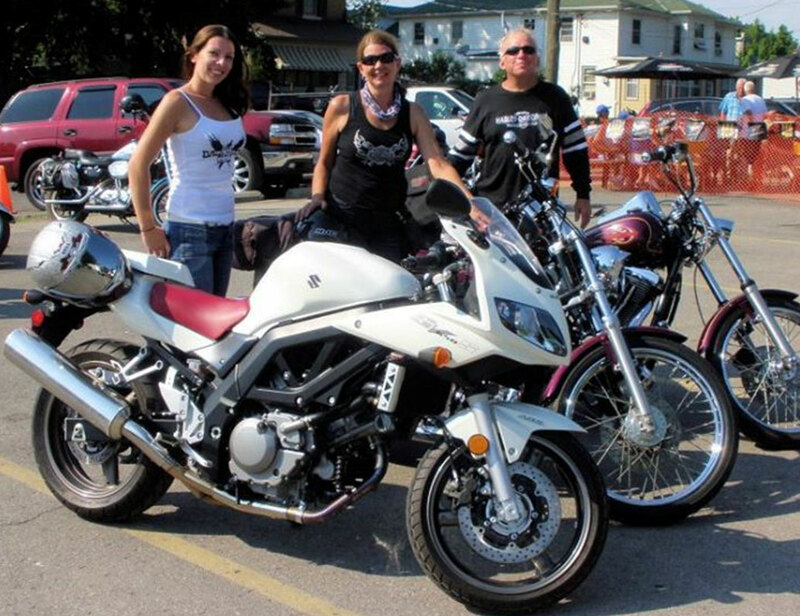 A picture taken at a Poker Run in Chippawa, Ontario.